1. In the present: There is emptiness and searching, trying many things hoping to find peace and purpose. 2. In the future: The penalty of sin is death. There are 3 kinds of death: spiritual death, physical death and the second death. 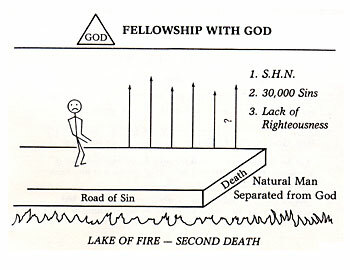 "But the fearful, and unbelieving, and the abominable, and murderers, and whoremongers, and sorcerers, and idolaters, and all liars, shall have their part in the lake which burneth with fire and brimstone: which is the second death" (Revelation 21:8). "In flaming fire taking vengeance on them that know not God and that obey not the gospel of our Lord Jesus Christ. Who shall be punished with everlasting destruction from the presence of the Lord, and from the glory of his power" (II Thessalonians 1:8,9). If you were to die right now, according to the Bible where would you go? Most people realize that they are not perfect, that they have sinned, and that their sins must be paid for; so they try to earn salvation. In your opinion, what are some of the things people do, hoping to pay for their sins and work their way to heaven? 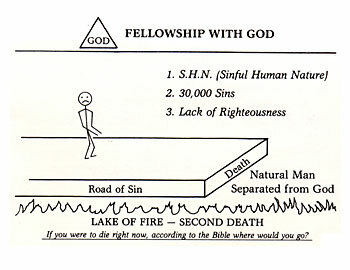 Which of these things are you depending upon to get you to heaven?